Solar wind flowing from this southern coronal hole could reach Earth as early as April 15th. Credit: SDO/AIA. 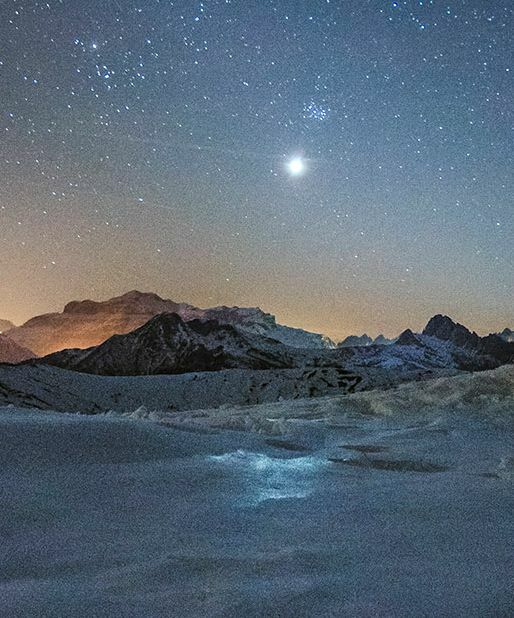 Hofer went outside after sunset to watch the ongoing conjunction between Venus and the Pleiades (note the star cluster just above Venus in Hofer's photo) "I set up my camera on Giau Pass over Cortina d'Ampezzo," she says. "Venus created a reflection of its light on the frozen snow "
Among all the stars and planets in the night sky, only the Moon is brighter than Venus. Because of its intensity, Venus can do things normally reserved for the sun and Moon--such as casting shadows or making snowy reflections. When the sun goes down tonight, step outside for your own Venus experience. Look west as the sky fades to black. The glaring Goddess of Love is only 2.5o from the Seven Sisters. It's a nice way to end the day. "Just a week ago, the Gulf of Bothnia was still completely frozen here," says Kast. "Now only the ice in the boat marina (on the left side of the photo) is still intact. If you look closely on the right side of the photo, you will see a wobbly line from ice floes drifting in the waves." "On the horizon, the afterglow from the sunset was visible for many hours," he adds. 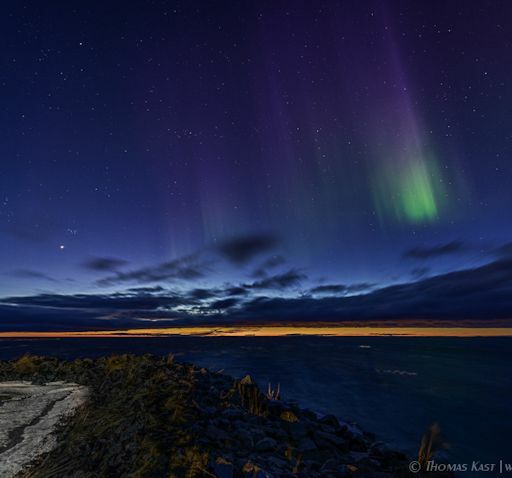 "Due to the aftereffects of the G2-class geomagnetic storm, auroras were visible to the eye very early." This photo says it all: "Goodbye winter, hello summer." 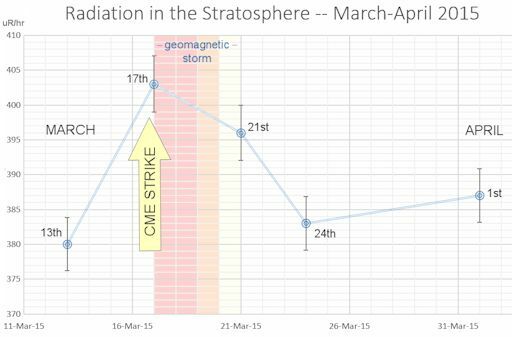 During the storm, which lasted for more than two days, cosmic radiation levels in the stratosphere jumped by more than 6%. 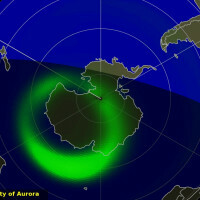 Radiation levels did not return to normal until a week after the CME strike. Six percent might not sound like a big increase, but consider the following: Atmospheric radiation levels usually decrease when CMEs sweep past Earth. The effect is called a "Forbush Decrease," named after American physicist Scott Forbush who studied cosmic rays in the early 20th century. Essentially, CMEs sweep aside some of the cosmic rays that surround our planet, causing radiation levels to drop. In Sept. 2014, for instance, our space weather ballooning program detected a sharp Forbush Decrease. A 6% increase--simply because it is an increase--therefore comes as a surprise. 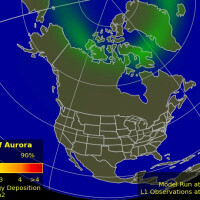 The reason for the jump may lie in the intensity of the St. Patrick's Day geomagnetic storm. 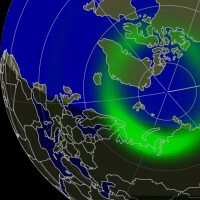 While Earth's magnetic field was reverberating on March 17th, high-energy particles normally trapped around Earth's poles spilled down to mid-latitudes where the space weather balloons were launched (from the Sierra Nevada mountains of California). These extra particles could have filled in the deficit and overflowed it, producing an "upside down Forbush Decrease." These results show that we still have a lot to learn about the response of Earth's atmosphere to solar storms. Stay tuned for more results from the ballooning program. For specialists: Radiation levels plotted above represent the peak of the Pfotzer maximum, located approximately 65,000 feet above Earth's surface. Each space weather balloon carried four independent radiation detectors sensitive to gamma-rays and ionizing particles in the energy range 10 keV to 20 MeV. On Apr. 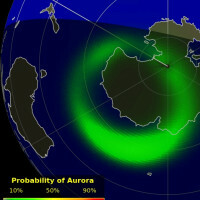 11, 2015, the network reported 7 fireballs. On April 11, 2015 there were potentially hazardous asteroids.